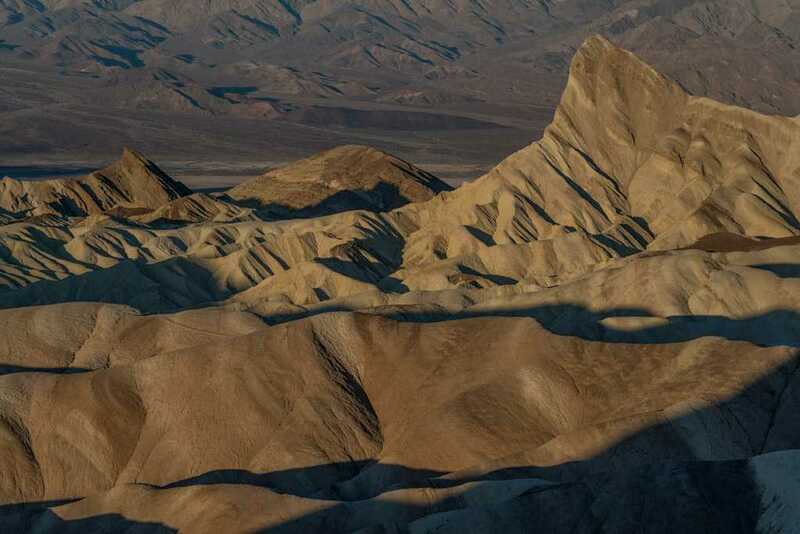 Death Valley is the largest National Park in the lower 48 states. It is my favorite winter destination. 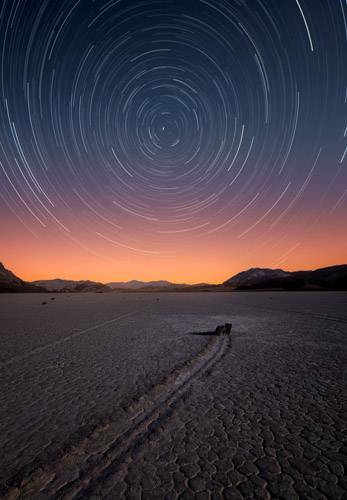 Death Valley's Furnace Creek area is only about two hours from Las Vegas, and Stovepipe Wells is only four hours from Los Angeles. 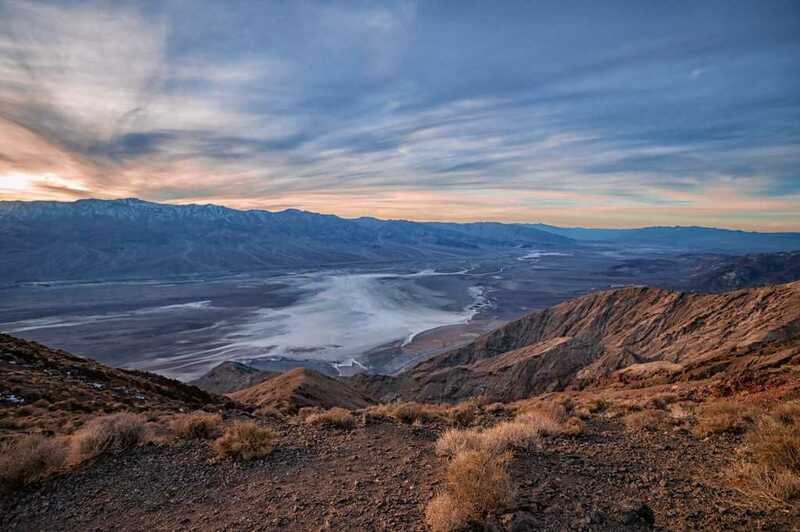 Many of the best photo opportunities in Death Valley require only short hikes. 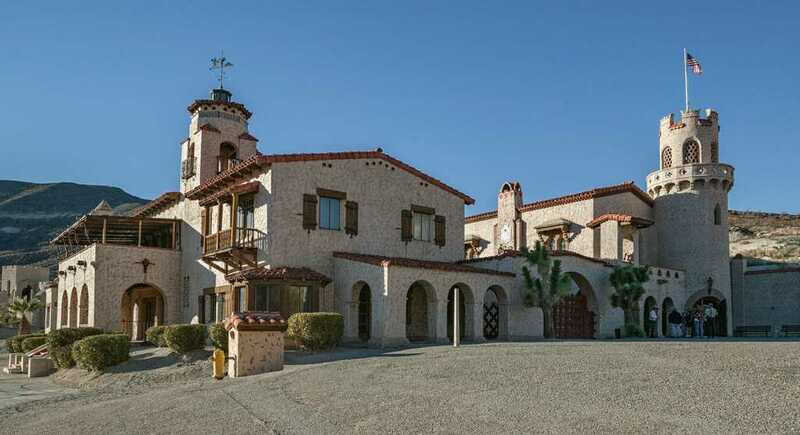 These include Zabriskie Point, Badwater, the Mesquite Dunes, the Racetrack, and Scotty's Castle. There are three lodges within the park and many campgrounds. This makes it easy to stay within Death Valley most of the year. Exceptions include holiday weekends, and during rare "superblooms" of wildflowers. 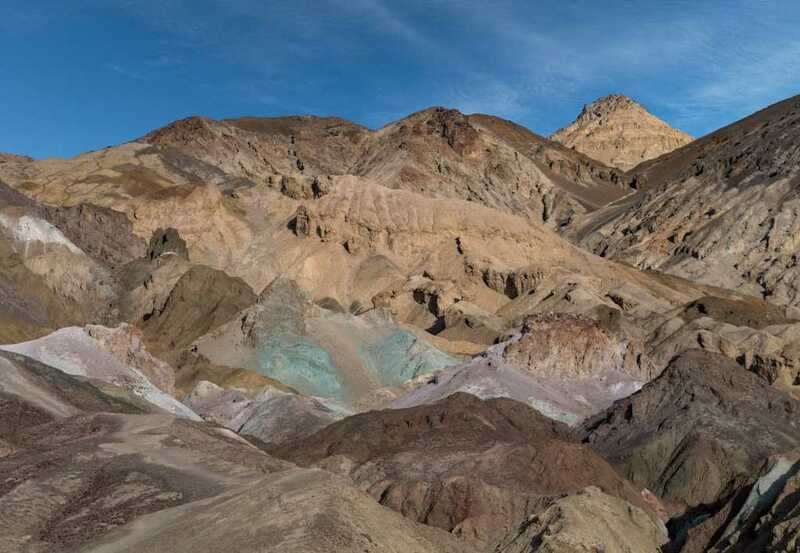 In short, Death Valley is an easy park to visit with short hikes, pleasant temperatures, and many great photos to be had. Visiting Death Valley is not without its problems. Distances are vast and there are only two gas stations. 4WD is needed for some of the destinations such as "The Racetrack", lodging and food can be pricey, and internet and cell service are scarce to non-existent. Summers in Death Valley should be avoided. They are incredibly hot. Death Valley's clear skies and haze sometimes make photography difficult. Below is the official Death Valley National Park map as a jpeg and in three geocoded formats, as a GeoTIFF, as a KMZ file, and in Oruxmaps format. The official park map as a Geo PDF can be found here. The jpeg image below displays in low resolution, however if you download it you will get a full resolution 300dpi image. To download the full resolution jpeg right click on the image and choose Save Image As. Death Valley is open every day of the year. Some campgrounds and hotels are closed from mid-May through mid-October. The period from mid-October through April is the best time to visit the park. Visitation peaks over holiday weekends and lodging may be unavailable then. Avoid Thanksgiving, Christmas and New Year's, Martin Luther King Day, and President's Day if you wish to dodge the crowds. Wildflowers peak from mid-February through mid-April. During a rare "superbloom" visitation in March can be double that of normal levels and lodging will be impossible to get. The superbloom in 2016 peaked on the valley floor in late February, an excellent time to visit. The National Park Service maintains visitor statistics on their website here. 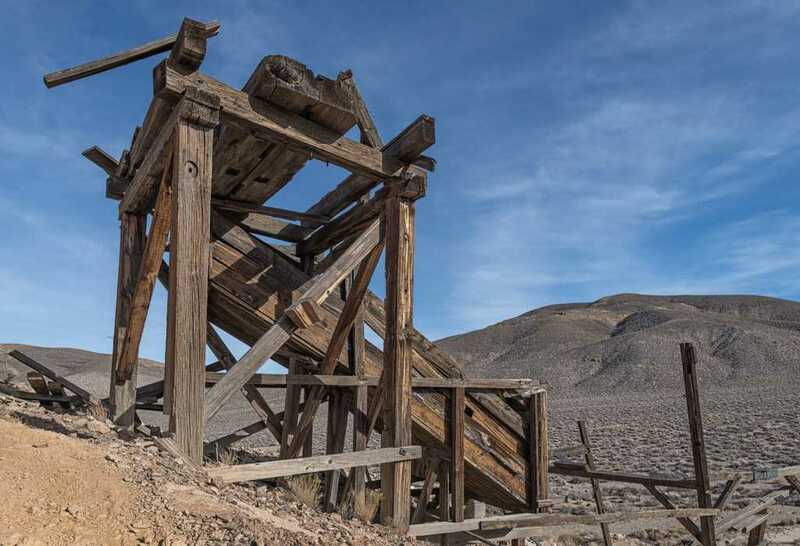 Lodging within Death Valley is moderately expensive and cell and internet service are poor to non-existent. 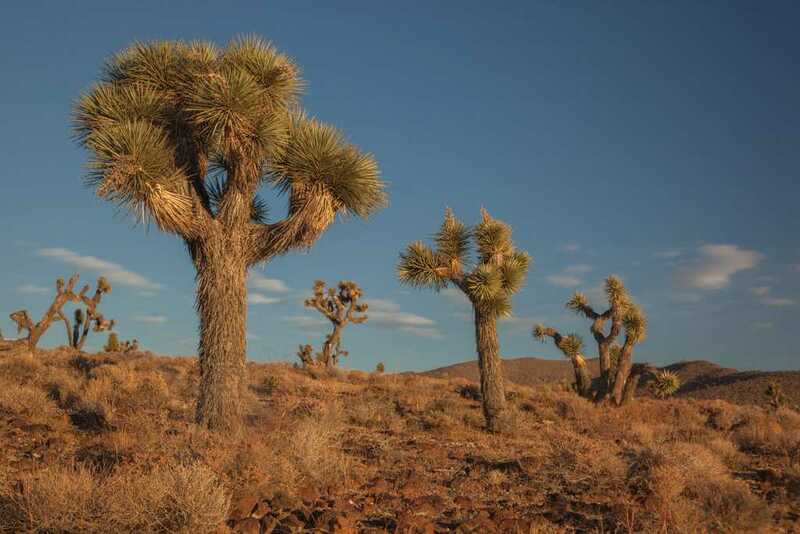 Cell service is best in the Furnace Creek area. There is limited service near Stovepipe Wells. 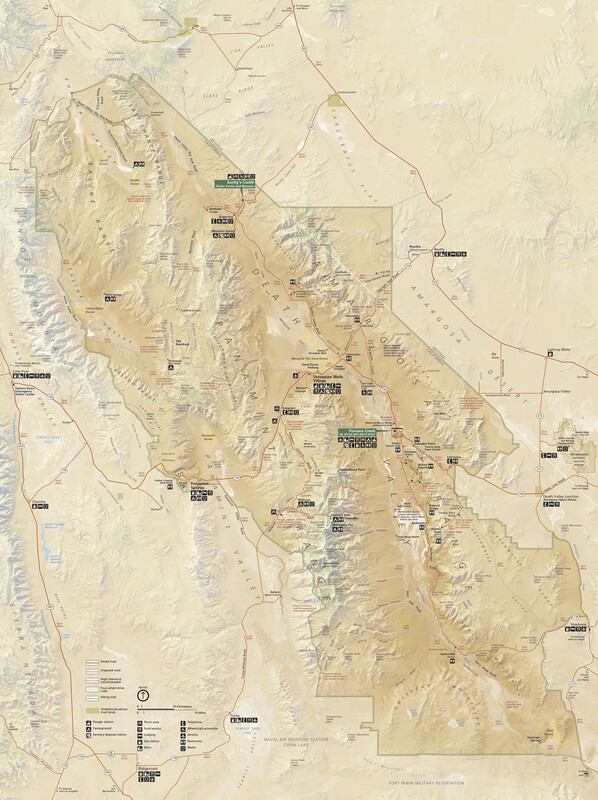 When I visit Death Valley I either camp in the park or stay at Stovepipe Wells or in Beatty, Nevada. While Beatty lodging is on the economy side, food and rooms are inexpensive, and gas, cell and internet service are readily available. 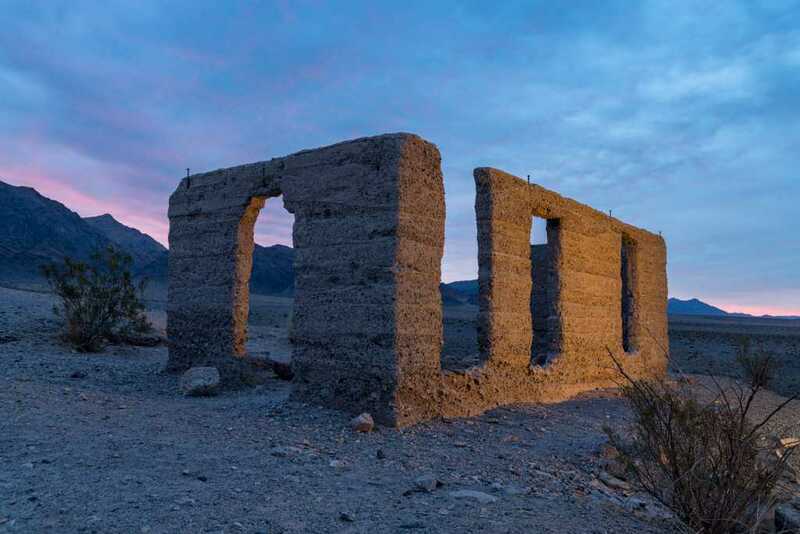 Beatty is only ten minutes from Rhyolite ghost town (a great photo op), and forty minutes from the Mesquite dunefield. 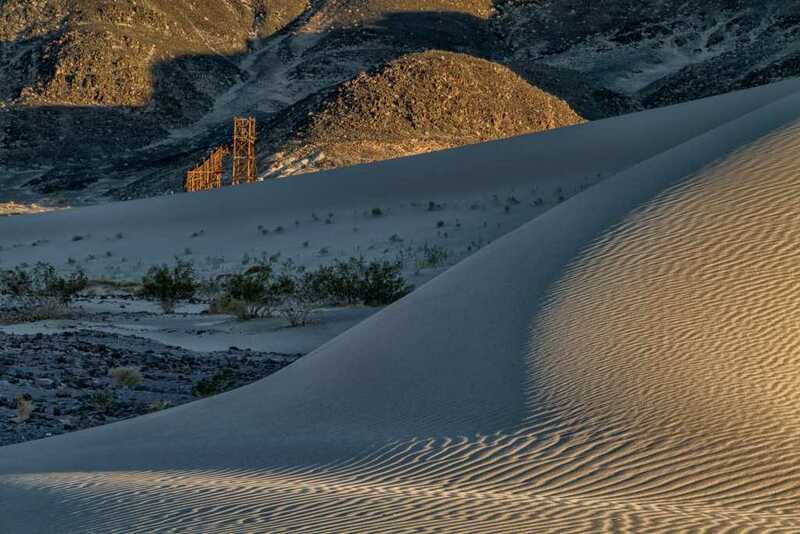 The Mesquite Dunes are the best photo op in Death Valley. Official information on lodging can be found here. Information on campgrounds can be found here. Information on "backcountry" camping can be found here. Data below is measured near the Furnace Creek Visitor Center, elevation -190 feet. The highest ground temperature ever recorded in the US was 201°F in 1972, the air temperature that day was 128°F. Expect temperatures exceeding 100°F from mid-May through the end of September. 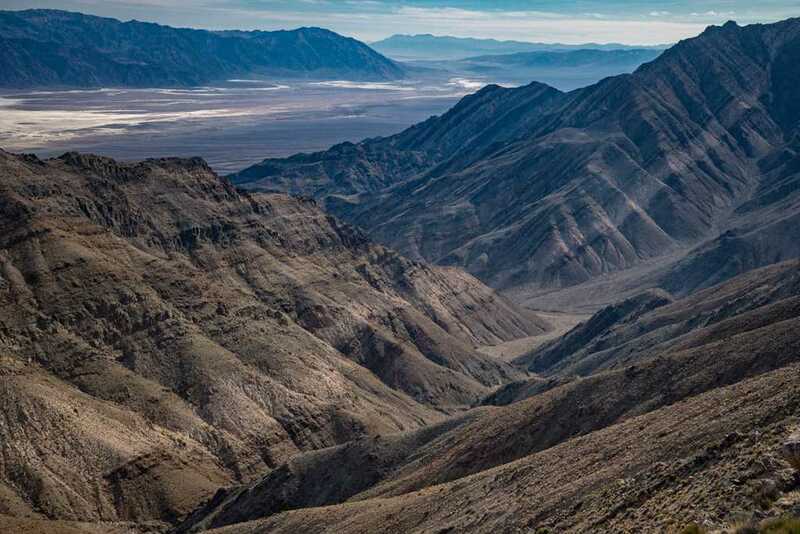 The world record, highest air temperature of 134°F (57°C) was recorded in Death Valley on July 10, 1913 at Furnace Creek Ranch. 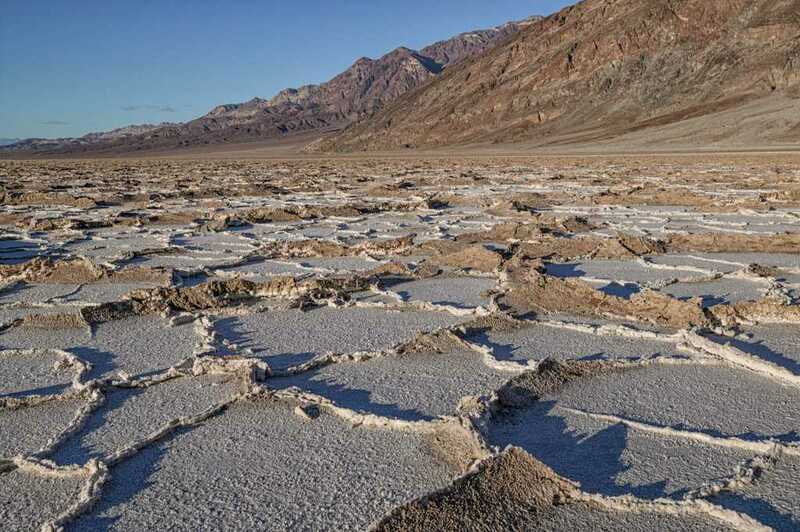 Historical temperature and rainfall data for Death Valley can be found here. Aguereberry Point 36.35795 -117.0479 Wildrose Peak *** Late afternoon, 4WD, use a polarizer to cut haze. On the drive in stop at Eureka Mines. Artists Palette 36.36352 -116.80266 Devils Golf Course *** Best late afternoon to sunset. Shooting from the overlook at the parking area produces unremarkable images that are front lit. I suggest you hike in closer to the Palette for more interesting compositions. Ashford Mill Ruins 35.91863 -116.68322 Shore Line Butte **** Excellent for Milky Way shots with the ruins light painted or lit by a slender moon. Good in the blue hour, sunrise, and sunset. Wildflowers in foreground help image greatly. Badwater 36.22985 -116.76743 Badwater *** Good early morning, late afternoon. Use a wide to emphasize the salt ridges. Consider shooting in the general direction of the sun to emphasize the salt ridge shadows. The quality of the salt ridges varies greatly from year to year. 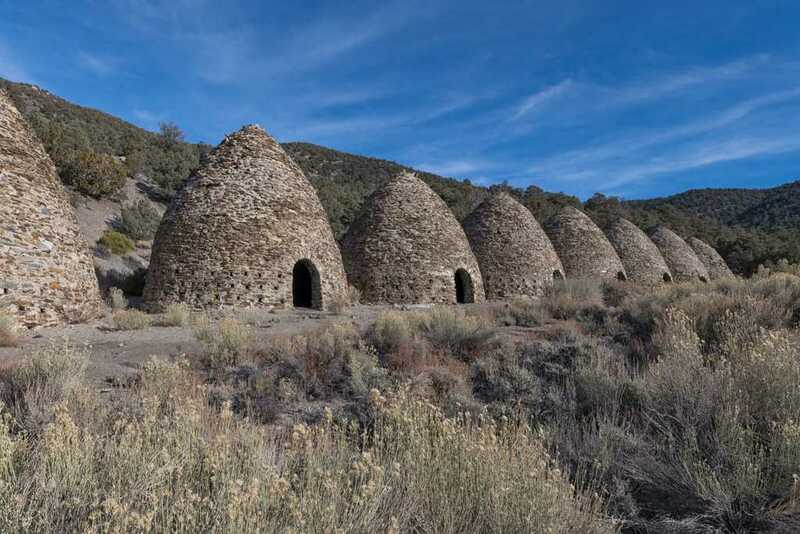 Charcoal Kilns 36.24659 -117.07629 Telescope Peak **** Best a few hours before sunset. After visiting the kilns stop at Aguereberry Point for sunset. An ultra-wide or panorama head is needed to get all ten kilns in the image. Great at night, place led lights in the kilns. Dante's View 36.22066 -116.72661 Dantes View **** Best near sunrise and during the blue hour, sunset works also. Eureka Dunes 37.11226 -117.68102 Last Chance Range SW **** Arguably the tallest sand dunes in the United States. Best late afternoon to sunset. At some point of almost every afternoon you'll be greeted by a squadron of low flying fighter jets buzzing the dunes. A long drive on a 4WD road is required. I suggest you camp at the dunes to avoid doing the drive at night. Eureka is a linear dune running north south so it is often front lit. Eureka is seldom visited; you might have it to yourself. The lower dunes at the south end are better subjects than the main dune, but they are almost two long miles from the parking area. On the plus side you won't find footprints at the south end of the dune field. Golden Canyon 36.42065 -116.84683 Furnace Creek ***** Mid-late afternoon, the Red Cathedral area is excellent. Lee Flat 36.43659 -117.62194 Lee Wash *** Many Joshua Trees, best blue hour, sunrise, sunset, Milky Way shots at night. 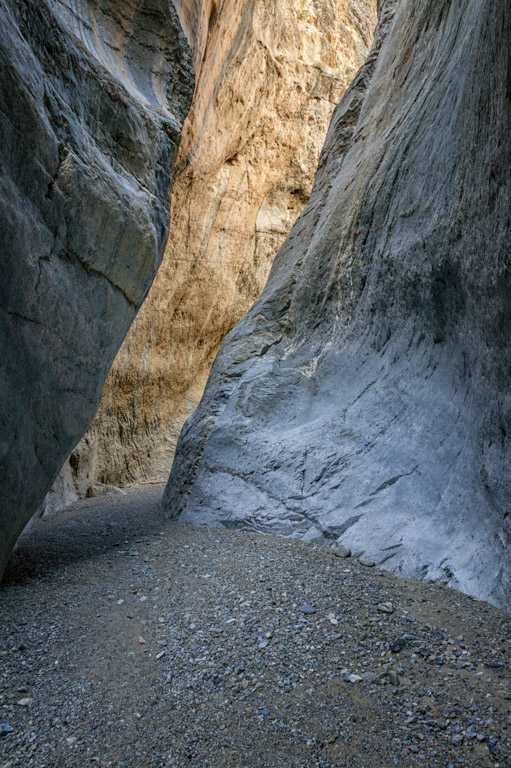 Marble Canyon 36.61886 -117.33055 Cottonwood Canyon *** Best around noon, long 4WD drive from Stovepipe Wells. 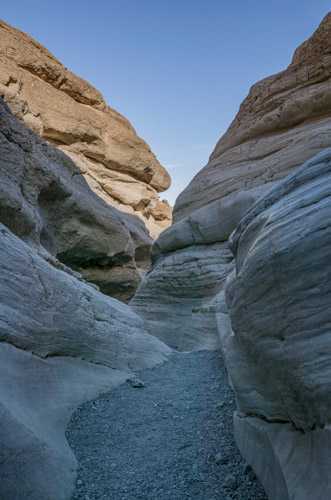 Mesquite Dunes 36.60548 -117.11098 Grotto Canyon ***** Best photo ops in the park. Only good near sunrise and sunset or during the blue hour. Sunrise works better than sunset as there will be fewer footprints, less wind, less haze, fewer people, and the angle the sand ridges present to the light is better. While most people hike to the top of the tallest dune, I find the east end of the dunes to be the most photogenic. I usually park about .4 miles east of the main parking area near Grotto Canyon Road. Park along the side of the main road. 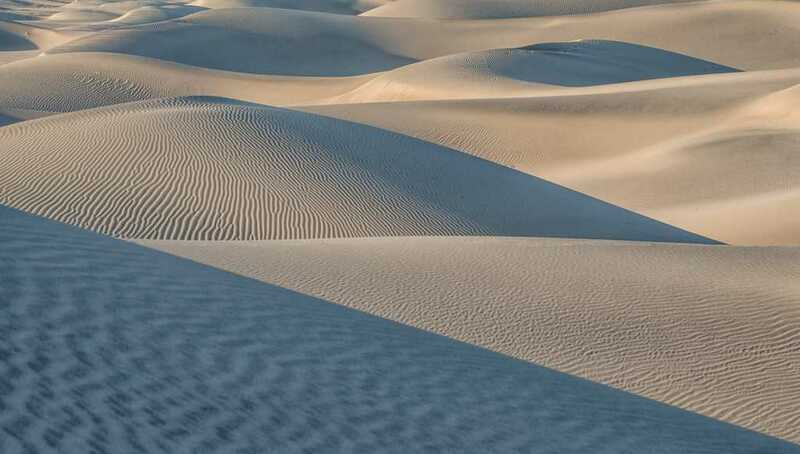 Compressed telephoto shots work well, hike to the top of a dune and scan the dunefield for interesting sand patterns. You will need a 150mm - 300mm lens for these shots. Consider including someone in the image for scale. A polarizer can do wonders if there is haze. You can drive up Grotto Canyon Road to get overview shots of the dune field. Mosaic Canyon 36.57197 -117.14433 Stovepipe Wells *** Best around noon, short 2WD drive from Stovepipe Wells. 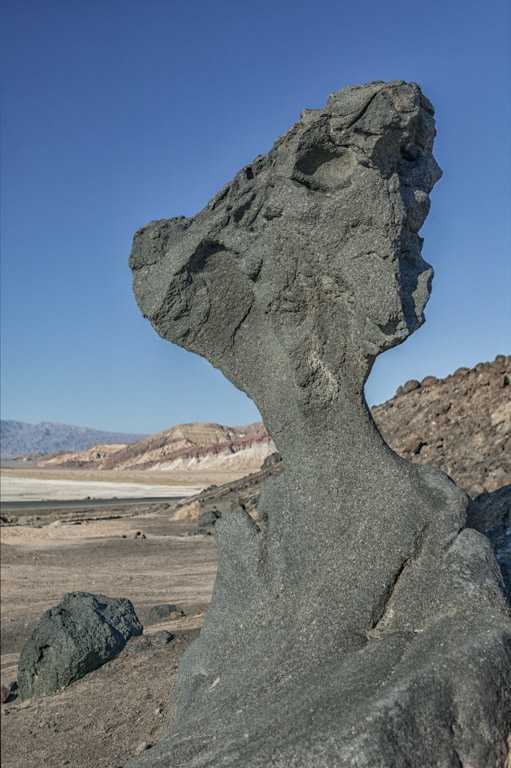 Mushroom Rock 36.38707 -116.85158 Furnace Creek *** Late morning is probably best, shoot low to the ground to the NW. 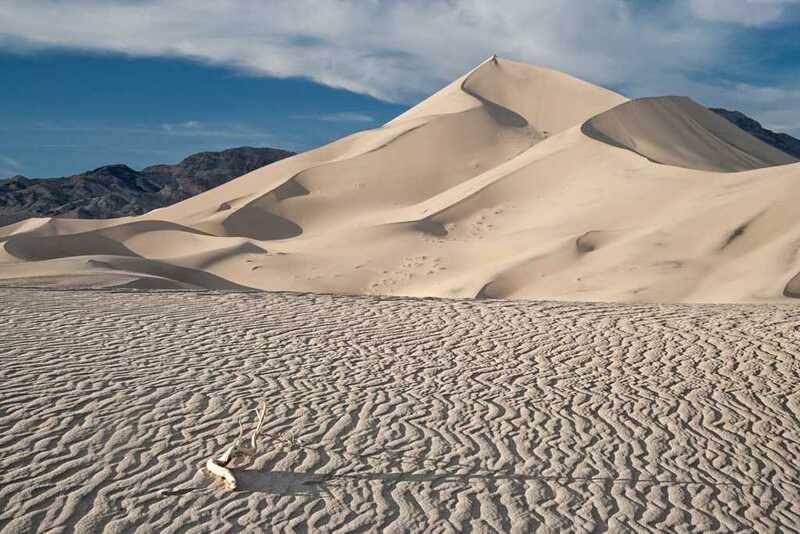 Panamint Dunes 36.45739 -117.45886 The Dunes *** 4WD required, and a seven mile RT hike. Guaranteed you'll have these to yourself. Best at sunrise and sunset around the winter solstice. Racetrack 36.66574 -117.56822 Ubehebe Peak **** Best at sunset and at night. It has become very popular and there will be many other people present requiring patience or cloning. A long 4WD over a rocky road is required so if you'll be shooting at sunset plan on camping at Homestake Dry Camp. Many people get flat tires on the drive to/from the Racetrack. Scotty's Castle 37.0323 -117.34139 Scottys Castle **** Unfortunately closed until 2020 due to road and other repairs. When it reopens be sure to do the tours of the interior, even though tripods are not allowed and light levels are low. There is a good circular staircase. Zabriskie Point 36.42006 -116.81223 Furnace Creek ***** Good in the blue hour and until Manly Beacon becomes harshly lit after sunrise. Very popular at sunrise. Arrive well before dawn if you wish to shoot during the blue Hour. Also good at sunset. 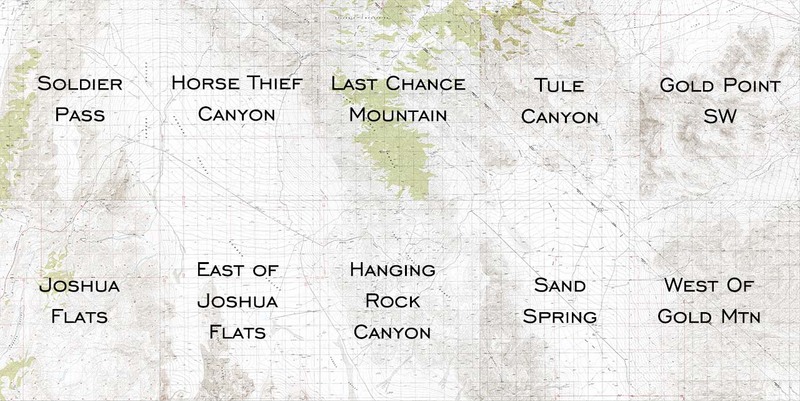 Ten topo maps are covered in this region. Click on the overview map below to display larger. 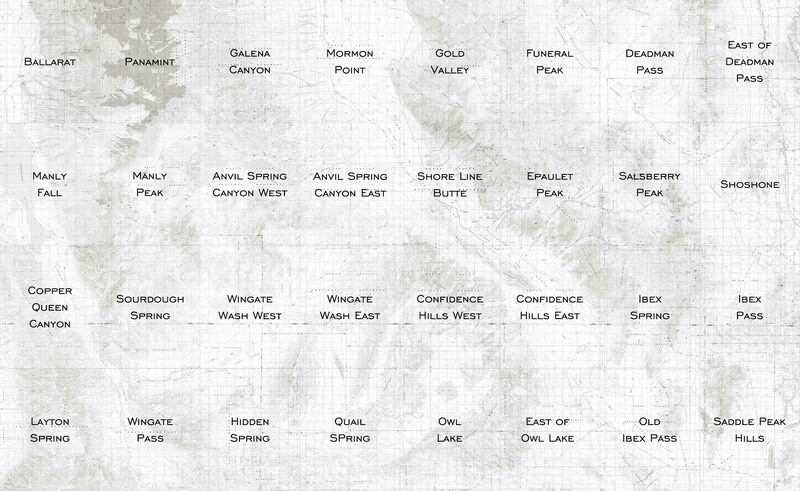 27 topo maps are covered in this region. Click on the overview map immediately below to display larger. 30 topo maps are covered in this region. Click on the overview map immediately below to display larger. 18 topo maps are covered in this region. Click on the overview map immediately below to display larger. 32 topo maps are covered in this region. Click on the overview map immediately below to display larger.